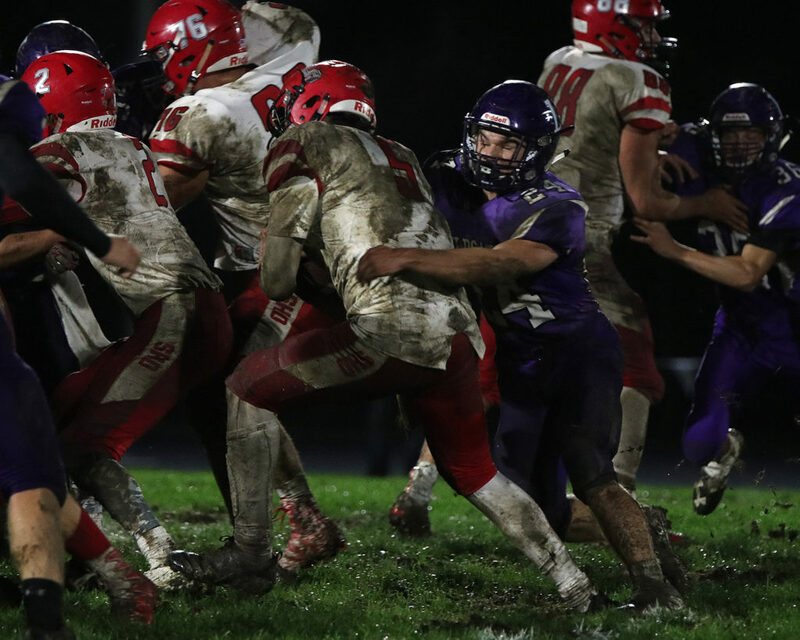 On a rain soaked and muddy field Friday, the Louisburg High School football team didn’t slip up against Ottawa. In its final regular season home game, the Wildcats left Wildcat Stadium with a perfect record as they shutout the Cyclones, 25-0, and are now 7-0 on the season. Louisburg also celebrated Senior Night as it recognized its 18 seniors and their families. Beckett Rasmussen, Gabe Rader, Josh Casey, Brayden Gage, Jakob Krause, Austin Moore, Jorge LeBron, Brian Houck, Brandon Cooper, Blue Caplinger, Dylan Knipp, Tanner Belcher, Kiefer Tucker, Noah Larson, James Foote, Cole Williams, Hunter Day and Jonathan DePriest were all honored before the game during a Senior Night ceremony. The game itself might have been less than perfect, but Louisburg coach Robert Ebenstein couldn’t have asked for a better way to send his seniors off in front of their home fans. 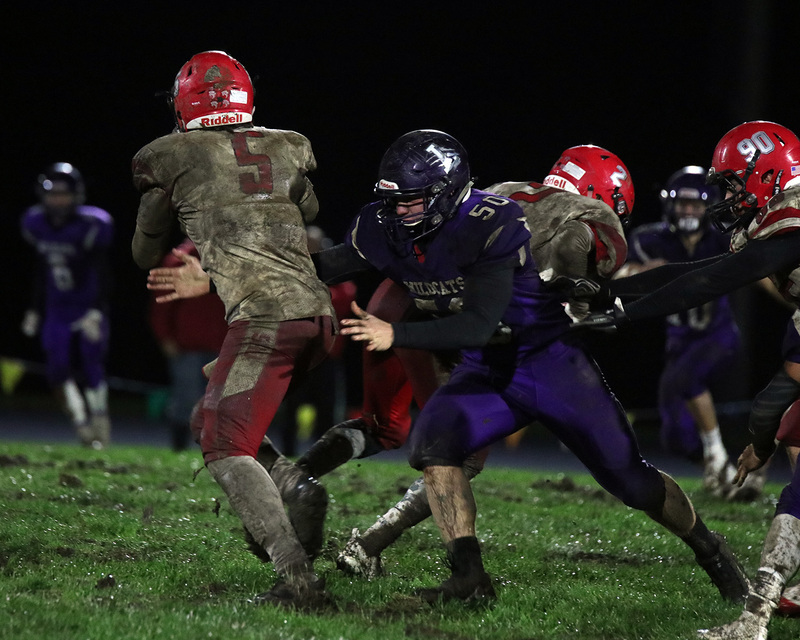 Field conditions played a big role in what Louisburg wanted to do offensively, but not even the mud and big divots in the field could stop the Wildcats from finding the endzone. The Wildcats opened the game with a pair of touchdowns and Louisburg never looked back as it jumped out to an 18-0 halftime lead. Charlie Koontz brings down an Ottawa player Friday in the Wildcats’ win. “This is the worst I have a seen in a football field in I don’t know how long, just with all the rain we had and everything,” Ebenstein said. “I challenged the kids to not turn the ball over and we didn’t have any turnovers. We had one possession in the third quarter where we made a couple penalties and stalled out, but we took care of the ball, they did what we needed to do and we got the shutout. Senior running back Austin Moore once again went over the century mark in rushing. Moore tallied 146 yards on 29 carries to go along with two touchdowns, including a 1-yard score on the Wildcats’ opening drive. Junior Charlie Koontz recovered an Ottawa fumble on its next possession after it was forced out by senior Noah Larson. Koontz was rewarded with an 11-yard touchdown pass from Madden Rutherford a few players later that put Louisburg up 12-0 late in the first quarter. Moore scored on an 8-yard touchdown run in the second quarter to give Louisburg an 18-0 lead at halftime and the Wildcats had more than enough points to come away with a win. However, facing a fourth down in the fourth quarter, the Wildcats came away with one more score. Sophomore Weston Guetterman, with a defender on his back, pulled down a 24-yard pass from Rutherford for a touchdown. Louisburg senior Kiefer Tucker wraps up an Ottawa player on Senior Night on Friday in the Wildcats’ 25-0 win. Defensively, the Wildcats shut down the Cyclones as they held Ottawa to just 87 yards of total offense. The win sets up a large contest in the Wildcats’ regular season finale when they travel to rival Paola. Louisburg and Paola are both currently undefeated and the winner of this Friday’s game will be crowned Frontier League champions and earn the No. 1 seed in the East for the state playoffs. It could be the biggest Louisburg/Paola game since 2010, when the two teams met in the sub-state playoffs for the right to go to the state championship. The Wildcats won that game and turned it into their first state title.